As a landscape designer who loves plants, one of the biggest challenges I've encountered is developing an interesting, dynamic, deer-resistant planting in the shade. As many homeowners have learned the hard way, most "go to" plants for shade are the deer's favorite food. But having worked on my own property, as well as clients, I've developed a list of plants which the deer definitely will not eat and different design strategies to create dynamic and interesting plantings in this toughest of scenarios. Since deer narrow the potential plant palette tremendously, think in masses when planning your planting. Depending on the scale of your landscape, you need to think in larger single plant groupings because there isn't a large variety of plant material to choose from. A bonus benefit to this type of thinking is you avoid the specimen on top of specimen design approach common amongst some landscape designers. When plantings are done en masse, the result is usually a more natural, cleaner aesthetic. Secondly, utilize plant textures and foliar colors to give your plantings year-round interest. Two of my favorite deer-resistant plant choices for the shade are Hakenachloe sp. 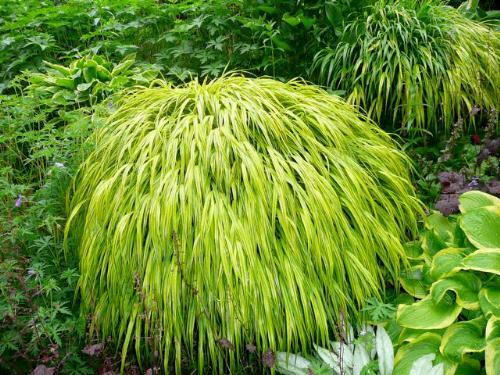 'Japanese Forest Grass' (above) and fern, neither of which produces flowers, but their textures and foliar colors are complimentary and interesting when planted together. If you couple these two with the larger, glossy leaves of the Hellebores you have a compelling planting without a flower in sight. Thirdly, don't forget the bulbs. Imagine Daffodils, Grape Hyacinths, Camassia sp. all planted in large drifts, blooming even before the leaves are on the trees- an early spring show stopper. By maximizing on these trusty pereniells, you can create visual memories to carry you through the seasons when bold colors are lacking. Finally, experiment, on a small scale, with new introductions and under utilized plants. Deer have regional tastes, where I live Daphne x ‘Carol Mackie' is a wonderful plant which handles a bit of shade, blooms a fragrant bouquet in spring and the deer don't touch it. A true winner, and I can count on one hand how many people in my area who have this plant in there landscape. By experimenting you may find a plant that deer eat in other areas is untouched in your neighborhood, start small and good luck! Pieris japonica Andromeda-cultivars, dwarf cultivars, variegated, etc. Skimmia japonica Japanese Skimmia-smaller, more formal apps. Leucothoe sp. Leucothoe-a bit finicky. Daphne odorata Fragrant Daphne-‘Carol Mackie', nice cultivar. Buxus sp. Boxwood-‘Wintergreen' has some tolerance for shade. Lindera benzoin Spicebush-will get nibbled, great for naturalizing.